In this chapter, we present a computational method, TarPmiR, for miRNA target prediction. TarPmiR is based on emerging features of miRNA–target interactions learned from CLASH (crosslinking, ligation and sequencing of hybrids) data. First, we introduce miRNA target prediction, delineate existing methods for miRNA target prediction, and discuss their usage and limitations. Next, we describe available CLASH data, the learning of new miRNA binding features from CLASH data, and the usage of CLASH features in miRNA target prediction. 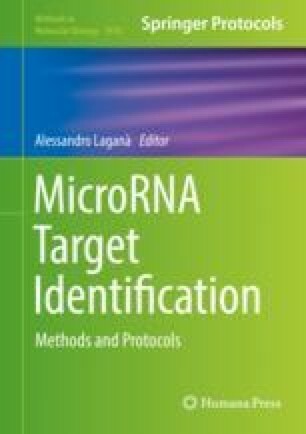 Finally, we detail the computational pipeline of TarPmiR, discuss its performance compared with existing computational methods for miRNA target prediction, and present its installation and usage for miRNA target prediction. This chapter will facilitate the common understanding of CLASH data, new characteristics of miRNA–target interactions, and the use of the CLASH based miRNA target prediction tool TarPmiR.